Posted September 19, 2012 & filed under Blog. • supporting proactive regional groundwater planning in areas with limited groundwater resources where increased groundwater use and development/population growth pressures are leading to water availability and sustainability issues related to groundwater and surface water resources. Posted September 17, 2012 & filed under Blog. In the first field test of Wellntel technology, an engineer and a homeowner were pleasantly surprised by the result. Not only did the technology work, Wellntel seems to be accurate too! Eighty-eight million Americans rely on groundwater supplied by community water systems, while another 42 million depend on individual household wells. via Groundwater even more important in times of drought. Posted September 14, 2012 & filed under Blog. via Measuring Ground Water from Space, 2002–2012 – YouTube. Posted September 12, 2012 & filed under Blog. via Governor Urges Citizens to Protect Groundwater | SurfKY.com. Posted August 28, 2012 & filed under Blog. Why our groundwater aquifers are heading towards bankruptcy | Guardian Sustainable Business | Guardian Professional. Posted August 27, 2012 & filed under Blog. Drought-stricken counties are forming a new water district to protect groundwater with price and regulations. Groundwater district in works to protect water source | water, district, source – Odessa American Online. “City of Kermit Director of Public Works John Sheppard said since the drought of 2011, the city never had to use water restrictions. The total rainfall for Kermit in 2011 was 1.8 inches, while meteorologists with the National Weather Service in Midland said so far in 2012, Kermit has received 8.28 inches. “The citizens, with enough being splashed about water being scarce, our (water) sales have been down this year and citizens are just stepping up to the plate on their own,” Sheppard said. Posted August 17, 2012 & filed under Blog. That Sinking Feeling About Groundwater in Texas – News Watch. When drought forces farmers to rely exclusively on groundwater, neighbors and communities are impacted too. For homeowners, it is vital to know that your well might run dry before it does! Posted August 14, 2012 & filed under Blog. This simple, non-scientific poll will give you insights into how others get water. Please take 3 seconds to answer. Posted August 13, 2012 & filed under Blog. Demand for water outstrips supply : Nature News & Comment. In a groundbreaking (pun intended) report, the Journal Nature explains how ground water resources are being stretched in many parts of the world, including in the U.S. 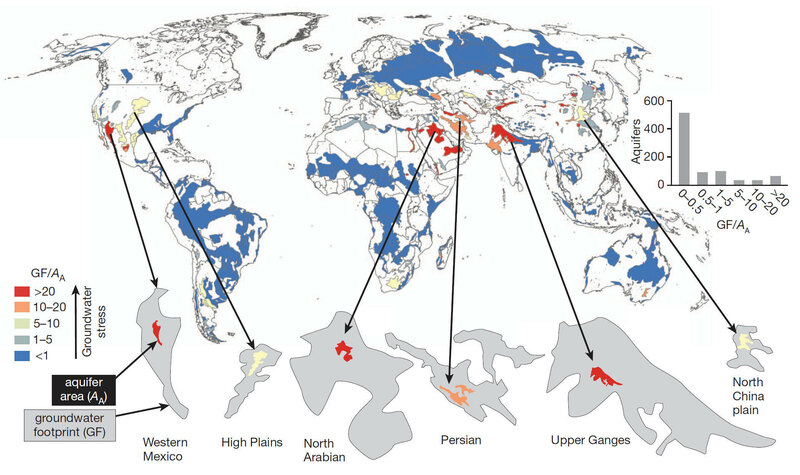 The authors found that 20% of the world’s aquifers are being overexploited, some massively so. The most important next step: know about how much is being used, the rate of recharge, and use a sustainable amount.